Photo by Joshua Davis via Creative Commons/Flickr. It’s that time of year again. The Blue Angels are returning for their annual Seafair air show performance, which means they’ll be buzzing Beacon Hill for a few days later this week. Blue Angel #7 arrives today, the team arrives tomorrow, and the practices and shows start on Thursday, August 2. During the Blue Angels’ performances and practices, I-90 will be completely closed to everyone—vehicles, pedestrians, and cyclists, in both directions, between I-5 and Island Crest Way on Mercer Island. Be aware that the Angels fly very low over North Beacon Hill — it can be a pretty good show, but also startling if you’re not used to it. Your pets may be frightened, so be careful and keep them safe. Blue Angels flying directly over 17th Ave. S. Photo by Wendi. 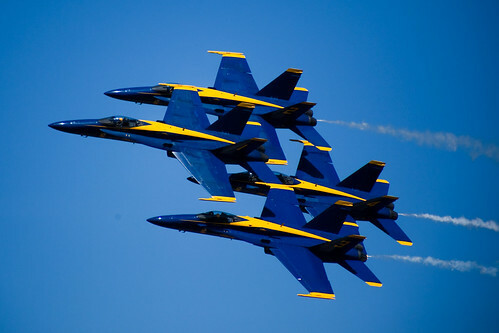 The Blue Angels are back in town for Seafair, which means that Beacon Hill residents can expect the usual close-up view of the Angels as they practice and perform their choreographed aerial acrobatics directly over our neighborhood. The squadron will practice on Thursday, August 4 from 10 a.m. until noon and again from 1:30-2:30 p.m. Actual performances will be on Friday, August 5, through Sunday, August 7, each day from 1:30-2:30 p.m.
Practices and performances will force complete closures of I-90 due to Federal Aviation Administration safety rules, so be aware that there will be congestion. If you need to drive across the lake using I-90 on Thursday – Sunday mornings, you should drive at least one hour before the closure times. On Thursday, I-90 will be closed twice. The express lanes will close at 9 a.m. and reopen by 3:30 p.m., and the mainline will close from 9:45 a.m. until noon, and then again from 1:15-2:30 p.m.
On Friday, Saturday, and Sunday, the express lanes will close at least two hours before the shows and reopen by 3:30 p.m., and the mainline will be closed from 12:45 – 2:40 p.m. each day. There will be loud noise from the jets during the practices and performances, so take special care of your pets. 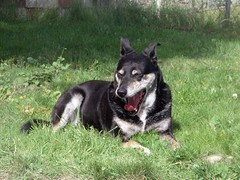 As on the Fourth of July, some pets react negatively to the loud noise from the Blue Angels and may run away. 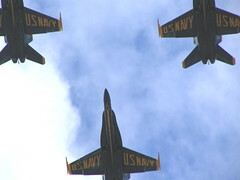 For further information about this year’s air show, see the Seafair website.